Peel, cube and steam your potatoes until they are soft. Mash in a bowl with the Earth Balance and salt then let cool to room temperature. While you're letting it cool, prepare the pesto. Roughly chop the 3 cups of basil leaves and combine in a food processor with the almond meal, olive oil, salt and juice of a lemon. Blintz in the food processor until all the basil leaves are evenly desiccated. Spoon into a large bowl and set aside (the finished gnocchi will be mixed into this bowl later). Back onto the gnocchi-- Mix in the flour to the dough, adding more if needed. The goal with the gnocchi dough is to be rolled out into long snakes without falling apart-- if the dough falls apart, add more flour until it holds its shape. On a generously floured surface, roll out the dough one snakey at a time. At the same time, prepare a pot of boiling water. Using the side of a fork, cut into the snake making little gnocchi "pillows". Once all of the dough has been "forked" and made into pillows, add in small batches to boiling water. The pillows will sink to the bottom, but after about 2 minutes they will begin to float to the surface. IMMEDIATELY get those suckers outta there with a slotted spoon and carefully place in the large bowl with the pesto. Repeat this process until all of the pillows are cooked! 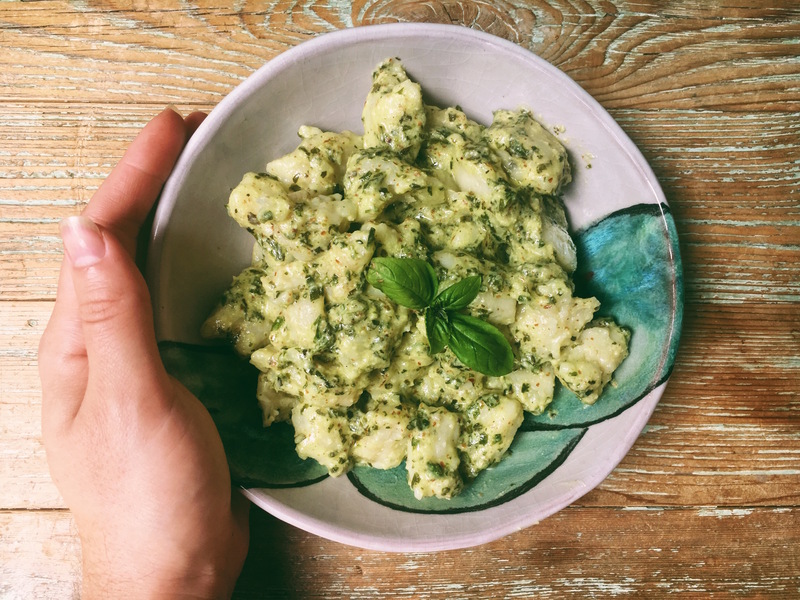 Using a wooden spoon, gently mix the pesto and the gnocchi to fully coat. Enjoy! Pillows can be frozen and stored! I re-coated them in flour for easier pulling apart later. I am doing this to prepare for Hurricane Irma.